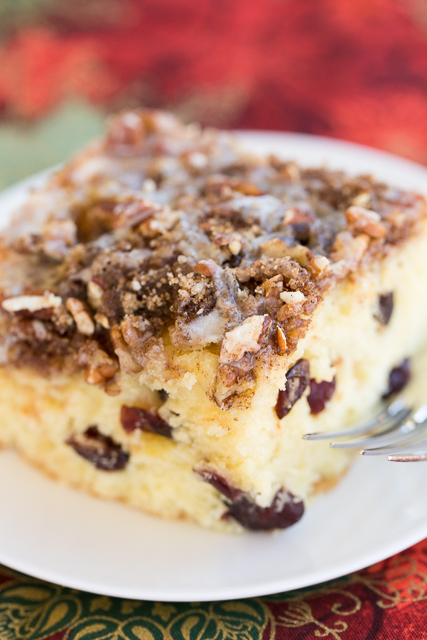 Overnight Cranberry Eggnog Coffee Cake - refrigerate batter overnight and bake in the morning. This cake is SOOOO good! I don't even like eggnog, but I LOVED this cake! Butter, sugar, eggs, eggnog, sour cream, vanilla, flour, orange extract, dried cranberries, cinnamon, brown sugar and pecans. This is INCREDIBLE! We like it warm right out of the oven. 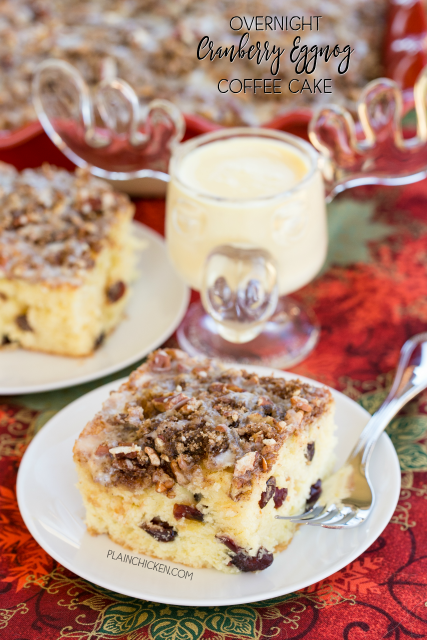 This Eggnog and Cranberry Overnight Coffee Cake is the perfect Christmas morning breakfast. You make the coffee cake the night before and bake it the next morning. The cake is so moist and delicious, and the topping puts the coffee cake over the top. SO good! The cake and glaze use store bought eggnog. I bought a bottle from Publix. I'm not an eggnog drinker, but this cake was delicious with the eggnog in the batter and glaze. We liked the cake slightly warm. If you are having leftovers, pop it in the microwave for a few seconds. Perfection! I cannot wait to make this again for Christmas Day! In a large bowl, mix together butter and sugar with a handheld mixer until fluffy. Add eggs, beating well. Add half of the flour to the butter mixture. Stir in sour cream. Add remaining flour. Add eggnog, mixing well. Stir in vanilla extract, orange extract and dried cranberries. Pour batter into a lightly greased 9x13-in pan. Combine brown sugar, chopped pecans and cinnamon. Sprinkle over batter. Cover pan and refrigerate overnight. Preheat oven to 350ºF. Remove cake from refrigerator and uncover. Bake for 35 to 40 minutes. Remove from oven and cool for 15 minutes. For glaze, whisk together powdered sugar and 2 Tbsp eggnog. Add additional eggnog to get desired consistency. Drizzle over cake. Serve warm. I wonder if you could use fresh cranberries in this recipe. Have you ever tried it?